E.O.W Round 5: Fungal Tunnel - THE BIG VOTE! Thread: E.O.W Round 5: Fungal Tunnel - THE BIG VOTE! Please vote for your personal favourite artwork from this round. Please remember that your vote should reflect an equal weight of aesthetic impact, adherance to the brief, and idea development. Your votes will be public. Please help strengthen the activity by leaving criticism for the artist you vote for, and for any other artworks you can manage! This old, abandoned, mushroom-infested mine shaft has seen better days. 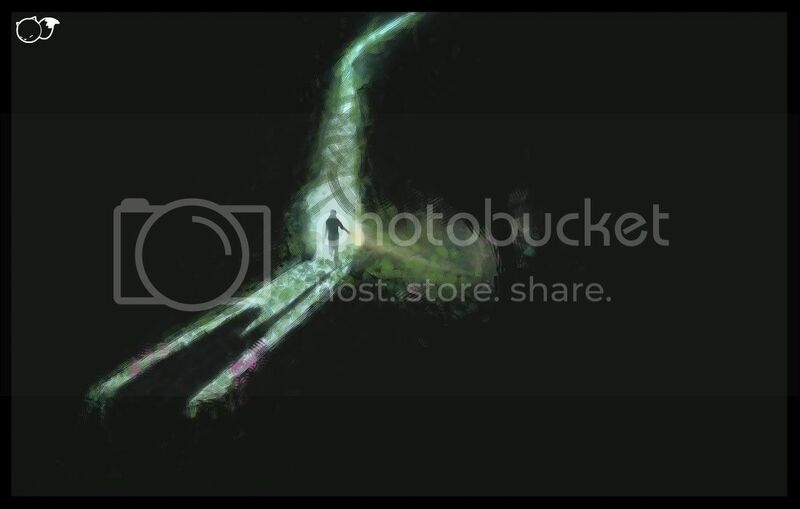 I was thinking of a slime mold that grew down a tunnel, tossed in some shrooms for color, and tadaaaa! Instant fungus tunnel. "Beyond the arid sea, lies the remains of once ancient creatures...and a vast unherald forest filled with fantastical plants, sporelike in nature"
As the wanderer approaches his destination, he finds a page from the early chapters of his life standing in his path. The fungi of the infamous Tunnel of Fungi is renowned for it's life saving attributes, as well as it's addictive nature. "And so, despite the terrible dangers of long-term spore infection, a foolhardy few would return to the surface every year to see the mjongha fungus in full display; though most went to experience a mindless rush and euphoria as the ripe, sun-damaged spores burst inside them." 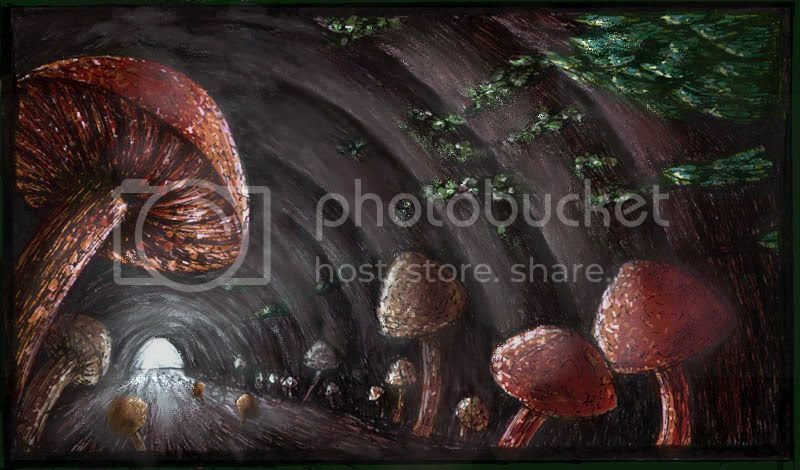 The Fungal Tunnel is a gateway-dungeon that connects the two main northeastern regions between the mountains. Besides being a conecting point, it is also a mini-dungeon by itself, with hostile monsters, treasures, and quest oportunities. There are also several entrances, some hidden, some not, to other underground areas, and to more extensive dungeons beneath the mountains. The Tunnel is abandoned. Several species of mushrooms of all sizes from enourmous to diminute can be found growing on the floor. On the walls, species of lichen crawl the Tunnel's upper surroundings. Other information: some mushrooms and fungi can be picked up. What you can do with them varies, they can be used in potion preparation, sold, cooked, or eaten raw (Flora Knowledge would be advisable, or be equiped with the Fungal Tome). What's that smell? The recent discovery of a tunnel located deep in the congo has brought about a wave of new fungal discoveries. In the harsh jungles of the Feronus island colonies, the creatures known as the 'Fungal hunter' reside within the Dense and thick jungle vegetation. Hiding in the darkness of the 'Fungal tunnels' they wait for prey to hunt and kill to feed their children and protect the eggs. Local tribesman, knights and explorers come from all over the world to prove their worth by bringing home the 4 glowing eyes of the 'Fungal Hunters'. As the three men stand inside the entrance to the fungal tunnel their thoughts dwell on the advice of their lost guide. His knowledge alone would have seen them through to the end, but the battle against the tunnel guardian was too great for even him. His dying words were hard to distinguish, although they heard enough to question if they should even take another step inside. 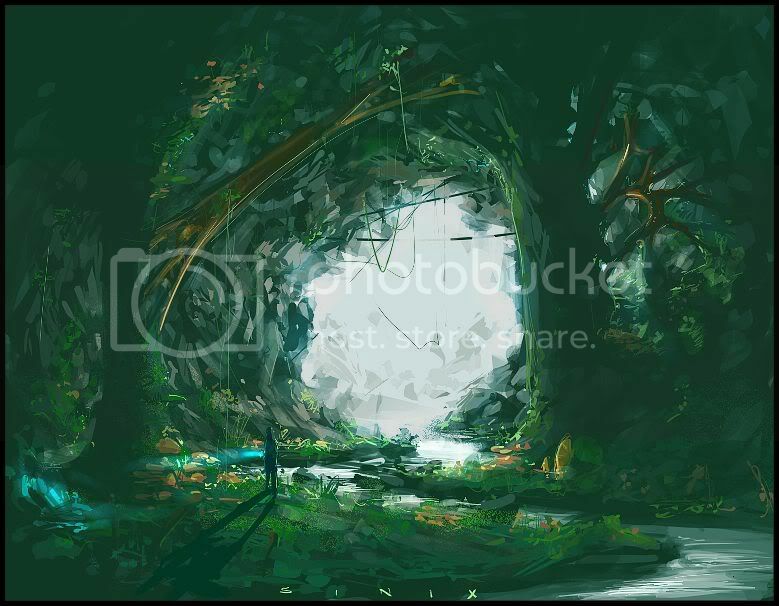 The tunnel, wound beneath the roots of the oldest trees, was carved by the guardian itself, a maze of passages, that if placed one after the other would stretch twice around the planet. Certain paths would lead to dead ends after days of travel, others, deeper underground, could be filled with poisonous spores released from mysterious growths. Their guide hinted at the secrets inside, of explorers who had taken it upon themselves to search for the many rumoured relics. Their inevitable deaths would leave behind a lifeline for future travellers…..
A deadly contagious disease has broken out and many are left ill. This new strain of disease has left everyone baffled. The only recorded medical information is found in the book of ancient chinese herbal medicine. Having no choice, a team of scientists set out to find this unique fungus. In the lower areas of a crater on mars, NASA discovered yesterday a tunnel filled with a strange breed of fungus. This fungal tunnel was created by some eccentric mage for his huge garden. It leads to small glade surrounded by rocks and covered with ivy. Another of the examples of harsh and unusual environment of Terra II are the Fungal tunnels. These have yet to be fully explored due to the poisonous fungus which thrive here. The hazards are too great for a full exploration of the caverns but the medical field believes that here they may find cures to some of the exotic deceases of the planet. here we see the opening to one of the tunnels on the continent state of Verfin. A young couple stumbled upon this cave and decided to explore it only to find the weird giant mushrooms?! 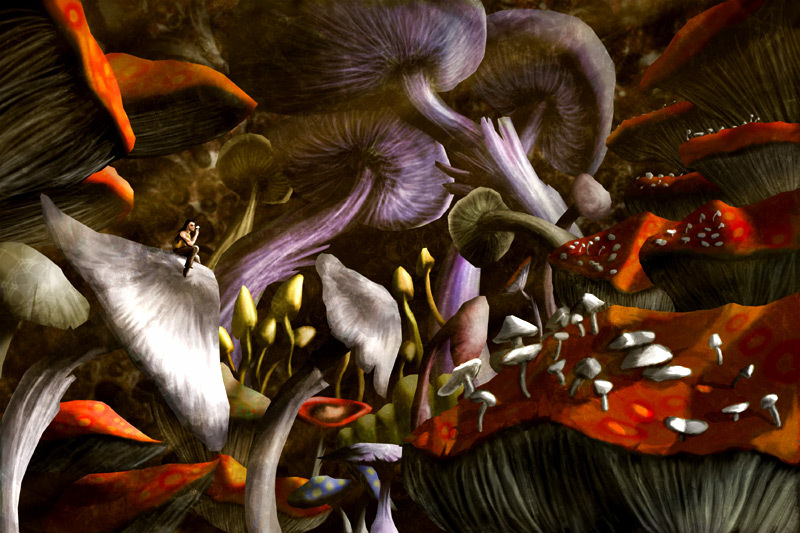 According to legend, the deepest secrets of the universe, and perhaps Paradise, lie hidden within the Great Mushroom Labyrinth of Kr'King. But whether this is true cannot be known, because while many have ventured into the labyrinth, none has ever returned. Environment pollution of Planet NewTerra 9 was very high. Cities buildings were almost destroyed because of acid rains and strong heat emission of both suns in this planetary system. Most of metals and plastics used to build any constructers weren’t resistant to new situation. But scientist has found a good material for new buildings - organic material - a kind of “mutated” mushroom. Genetically changed, it could be a raw material for buildings, roads, bridges or tunnels. “Weatherproof, cheap and good to natural environment”. Near Future. A constant extremely acid rain is falling onto the earth. Mankind live subsurface. Only some tough plants, insekts and fungi manage to grow overground. Fungi - that are the superior life-form now - even grow as high as trees. they filter the acid water with their Mycel. Planting the spores is tunnel like fields is the most usual way of domestication. Also the luminescent lamellae are an atraction to overground tourists at night. Last edited by Red_Rook; November 20th, 2005 at 03:34 PM. Voted for sketchling, because the view appealed to me the most. koshime, your colors are getting so nice! Anyways,m i went with Hideyoshi, i thought i was real absract and stuff, colours are cool to. Hurricans, Sinix's and Sketchlings stood out aswell. Hard choice between JakkaS and sketchling. I went with sketchling in the end, because I really like the composition and the mushrooms. The concept description is excellent, very funny, and makes me want to know more about the story. Very cool. Also I thought it was pretty original that the tunnel is vertical instead of horizontal. I hate to just go with the crowd, but I'm gonna have to vote for sketchling. Those are just the prettiest mushrooms, especially in the way the light kind of passes through them. Also wanna mention JakkaS, for cleverly showing a tunnel from the outside, and Sinix, for painting a place I'd like to visit. Nice work all around I thought. Went with Sketchling.. the color control in that piece can't be denied. Also loving blonde, koshi, home, hurri, hide, ahh.. alot of good stuff this round actually. I voted for Hideyoshi, but if not I would have voted for rushtoy. Those are my favorites. thx everyone who gave props to me or voted for my entry! homeworld: I really dig the angle and the composition! Nice colours and textures! One of my faves! koshime: nice one! Rich and varied colour palette! I would have loved to see the image extended to the left though, in order to balance the pic a lil' more. Mr. Blonde: you were a bit lazy on designing out and defining the shapes I think.... Colors and mood are conveyed well nontheless! Sketchling: great translucency, as mentioned already. I dig the composition, but still, I think it became too dark in the foreground. Sinix: great stuff as usual! But again, widening this image to one side would have led to a better composition imho. Phatandy: too bad, you couldn't quite finish your image. I like the variation of forms! Good job! max1975: there barely seems to be a point of interest that would grab the viewer's attention. Composition needs work. I think you concentrated too much on rendering out the fungi. JakkaS: nice idea! Colors work fine, but the perspective/angle is a bit weak. Depth is working fine, but you could have shown one of the tunnels from a slightly angled view imo. Zeitwolf: o_Ô Using cyphers on the fungi, huh? I thought you didn't like that in my pics! :-P Nice contrast work! thx for the vote! Really tough one. Lots of good entries, but my decision came down to Koshime, Sketchling, and JakkaS. All three were strong, but in the end I went for Koshime for the interesting composition and strong color choices. I voted for yADAM. I thought his piece was really beautiful and I loved his idea. I voted for Hideyoshi. Nice colours and texture. Voted for JakkaS, for taking an interesting approach to the concept while still making a very beautiful piece. Would have liked to have seen a wider range of values though, to really make things pop. Hideyoshi was a close second for me.. really enjoyed the organic design. Paint just jumps out at me, even the digital stuff!? I voted for hurricane cause I really liked the composition and the sence of a story in it. I could imagine myself there. I didn't vote, but this was a tough one. Everyone put out very good stuff, and each had a very cool... feeling to them. Thx for comments and votes! It was my first environment ever! I am not so good in this kind of drawing. E.O.W Round 29: Monolith - The Big Vote! E.O.W Round 25: Cafe - The Big Vote! E.O.W Round 12: Valhalla - THE BIG VOTE! E.O.W Round 11: Europa - THE BIG VOTE!